Colourist Heat Transfer Paints are normally only colourfast and bright when applied to synthetic fibres such as polyester. Now you can achieve stunning depth of colour and a colourfast finish on fabrics made of natural fibres such as cotton, silk and linen. The Pre-fixer does not alter the feel or drape of the fabric. 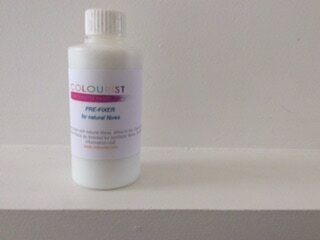 Colourist Pre-Fixer is a colourless liquid. Apply it to the surface of the fabric you are going to print and allow to dry. Application can be by brushing, spraying or immersing the fabric in the liquid. Drying time depends on the size of the fabric surface you are treating but around an hour at room temperature but faster if the fabric is placed on a radiator or use a heat gun to speed up the process. Once dry the fabric can be printed with Colourist Heat Transfer Paints following the method described in our How to Use page on this website.